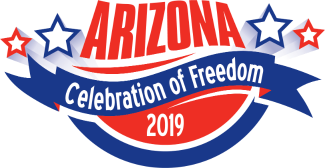 City of Mesa: 2019 Arizona Celebration of Freedom Event! 2019 Arizona Celebration of Freedom Event! Volunteers are needed for the 2019 Arizona Celebration of Freedom, the state's "coolest independence festival," held this year on Thursday, July 4. This is our 10th year and we plan to make it the biggest and best yet!! Volunteers are needed for a variety of shifts and activities including entertainment stages, family fun zone and more. Volunteers must be at least 16 years of age or 14 if accompanied by a parent or guardian. All volunteers will be given a commemorative t-shirt (while supplies last), snacks and plenty of cool drinks during their volunteer shifts. As always, all volunteers will have a chance to win gift cards, goodies or a GRAND PRIZE! If you have any questions please contact Bethany Freeland, at 480-644-5432 or [email protected]. Please note volunteer duties may vary on the event day based on current event needs and volunteers may be reassigned to other areas if needed. Your flexibility is greatly appreciated. Volunteers may assist with managing bounce houses, carnival games, maintenance of the area and various other tasks as needed. Volunteers may assist with managing water activities, water slide lines, maintenance of the area and various other tasks as needed. Volunteers may assist with tagging bags that have been checked, providing wrist bands, managing lines, and providing directions. Volunteer for this area must be 18 years of age or older. Volunteers will answer questions from the public, pass out programs, and provide child ID wrist bands. Volunteers will manage check-in table and provide direction and information to other volunteers as required. Volunteers may assist with loading and unloading band supplies, making sure green room is stocked and other duties as needed. All volunteers for this area must be 18 years of age or older. Volunteers may assist with distributing giveaways and festival programs to patrons waiting in the entry lines. Volunteers may assist with keeping the event clean and supporting other volunteer areas (family zones, guest services, entertainment stages, etc) as needed if there is a volunteer shortage. Volunteers will help hand out print material, manage sign up sheets, and provide basic information on programs (volunteer will be briefed) coordinated by the Diversity office. Volunteers may assist with handing out and collecting golf clubs and golf balls, general maintenance of the area, and other duties as assigned.